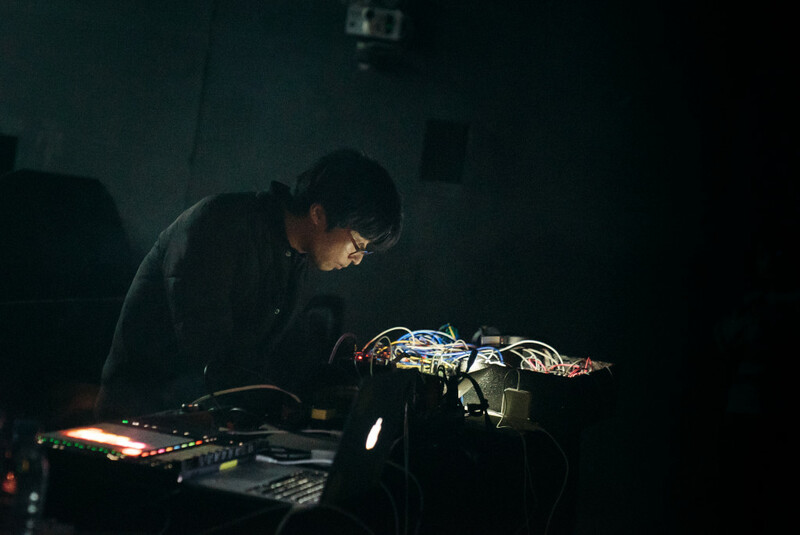 The mysterious, murky, glitchy-future sounds you hear from, AYRTBH, Shanghai’s Wang Changcun, emerges from an algorithm. That software can make this album over and over again without sounding the same. The artist explains – and shares a specially generated exclusive for CDM readers. Here at CDM, we’re no strangers to experiments with iterations in music. Icarus’ 2012 release Fake Fish Distribution used custom Max for Live devices to produce 1,000 generative variations, each sold to one customer and providing an individualized experience. Six year later and Shanghai-based Wang Changcun aka AYRTBH has released Song of Anon, an album available in two formats: as an eight-track traditional listen, or as a stand-alone generative app. Or download lossless FLAC from WeTransfer. I spoke to Wang about creating such a unique listen, and how it challenges our perceptions of authorship, what constitutes a piece of music, and composition. How does the Song of Anon app work? Why did you decide to distribute Song of Anon as both an app and an album? The App is a prototype of the album track’s rhythm algorithm, though for convenience all sounds in the App are synthesized through [Max/]MSP. Before recording Song of Anon tracks, I use the prototype system for testing. Inside the Max patcher for the Song of Anon app. Where would you draw the line of authorship using algorithmic software with user controls? If I adjust the controls on the Song of Anon app, is the song mine? Is it yours? Is it a collaboration between the two of us? Song of Anon app is not a “tool” software. It’s not supposed to be controlled, it runs in its own world outputting sounds. I think outputs of the app belong to the Song of Anon album. Yeah the app can be adjusted and interfered with, but after a certain duration of time it will go back to its own logic again. 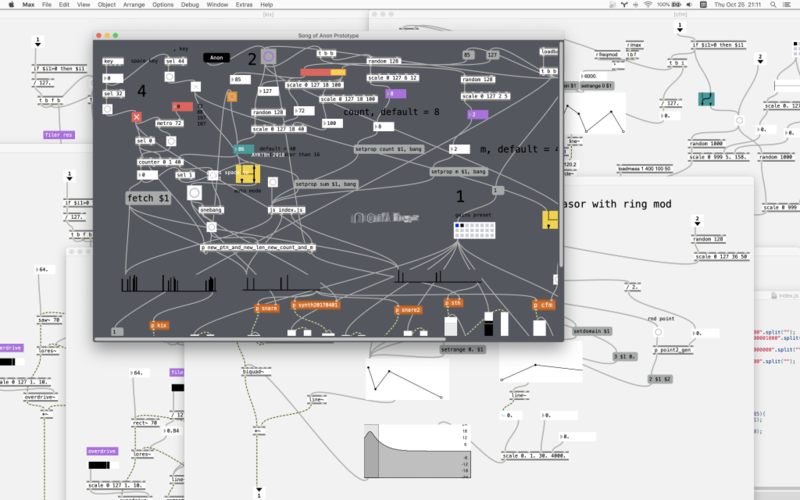 Song of Anon the App is composed and synthesized entirely in Max. Do you normally prefer synthesis over samples, or was this a choice relating to making Song of Anon its own system? Song of Anon Prototype the App is made entirely in Max, but not the album. In the album I also used the Madrona Labs Aalto synth for more complex sounds. For Song of Anon yes I only use synthesis, but in my 2017 EP MTK I mainly used samples. Is performing Song of Anon different from performing around previous albums? Yes, it’s a new performing system I built for Song of Anon. But basically the software (Live, Max, Numerology) are the same; the ways of using them are changed. Currently my performance setup is: Ableton Live as the central host, some selfmade M4L devices, [Five12] Numerology which is synced to Live’s clock, and sometimes Terminal and Max for generating parameter values of Numerology’s sequencer. How does Numerology fit in to the workflow? Are you using the generative/algorithmic features of Numerology, or just the basic step sequencing? I’ve been using Numerology since maybe 2009, and it’s still my favorite go-to sequencer if I want to quickly implement a sequencing idea. The modulation system of Numerology is very powerful, and you can even make a synthesizer in it using the LFO as an oscillator; there are envelopes, VCAs, and filters after all. Normally I use Numerology and Max together, learn things/transfer ideas from each other. Yes I also use the generative/algorithmic features of Numerology, and sometimes if doing something is not easy in Numerology I’ll make a Max patch as a helper. Have you thought of making/selling software (standalone, plug-in, or perhaps Max for Live devices) based on your sequencing work for Song of Anon? I do have a plan on making/selling software (standalone and Max for Live device) with another Shanghai-based electronic musician Gooooose, but not the patches I used in Song of Anon. It should be something can be easily “shared” to others, patches/devices from Song of Anon are too personal, they can only make Song of Anon tracks. I just finished the work for my first solo exhibition in Shanghai’s OCAT museum last month. 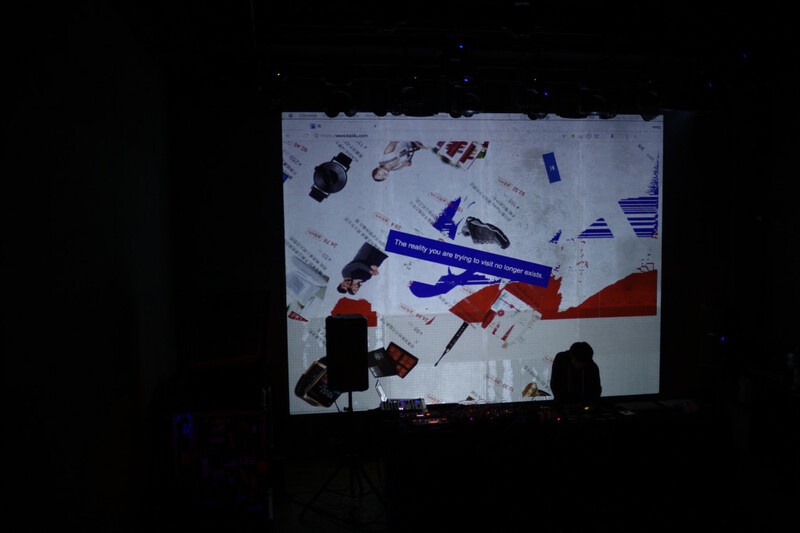 Now I’m working on two live computer music sets next month in Shanghai and Beijing, improving the Song of Anon system. During the interview, Wang directed me to Zhao Yue, who runs the Beijing-based label D-Force, on which Song of Anon was released. I spoke briefly to Zhao about her label, and she offered some perspectives and excellent recommendations for further exploring what D-Force has to offer. How do you go about marketing a release like Song of Anon, knowing that there’s also an algorithmic app version of it out there? The algorithmic app is a major part of our promotion actually. To us, the release works on two levels: the musical level and the conceptual level. On the music side it is a bit weird, but humorous and chill, and it speaks to fans who already know and trust Wang. But we did put more emphasis on the concepts and technology behind the record, which has more of a wow-factor. >We deliberately contacted more media in the IT, art and academic circles than what we’d usually do for a release. They responded very well to this and helped a lot with putting out press releases and giving us interviews. To be honest we were expecting obstacles “selling” this to media and platforms but their enthusiasm gave us a pleasant surprise. One contact from a major media platform gave us this feedback: “Of course we are tired of reporting on the idols and pop stars everyday. Something fun like this is refreshing for us too.” We have since realized that the Chinese audience have a very open mind when it comes to technical ideas, and this “art meets algorithm meets AI” idea really fires up people’s imaginations. Perhaps we should thank the general emphasis on tech and science in the Chinese society for this? The strong concept helps to get Wang Changcun’s idea over to more people than our usual music fans. How did you first get connected to Wang? We have heard of his name quite a long time ago. He’s considered to be one of the gurus in the field of experimental electronic music. Then we were introduced by one of our other artists called Han Han (he also produces and performs under the name Gooooose, and is the frontman of the band Duck Fight Goose). Han Han connected us because he felt that we were one of the few labels that were open to more experimental releases and, simply, that we could be personal friends. And he was proven right. What are some other artists/albums that you’re working with that you’d recommend, especially for fans of Song of Anon? This is a compilation curated by Han Han, and it is a collection of tracks from the pioneers of Chinese electronic music. Wang Changcun and Han Han (Gooooose) all contributed. This is a concept album about an imagined synthetic alien lifeform that exists in Han Han’s mind. Each track depicts one aspects of their lives.